This article is about the BIOS as found in personal computers. For other uses, see Bios (disambiguation). BIOS (/ˈbaɪɒs/ BY-oss; an acronym for Basic Input/Output System and also known as the System BIOS, ROM BIOS or PC BIOS) is non-volatile firmware used to perform hardware initialization during the booting process (power-on startup), and to provide runtime services for operating systems and programs. The BIOS firmware comes pre-installed on a personal computer's system board, and it is the first software to run when powered on. The name originates from the Basic Input/Output System used in the CP/M operating system in 1975. The BIOS originally proprietary to the IBM PC has been reverse engineered by companies looking to create compatible systems. The interface of that original system serves as a de facto standard. The BIOS in modern PCs initializes and tests the system hardware components, and loads a boot loader from a mass memory device which then initializes an operating system. In the era of DOS, the BIOS provided a hardware abstraction layer for the keyboard, display, and other input/output (I/O) devices that standardized an interface to application programs and the operating system. More recent operating systems do not use the BIOS after loading, instead accessing the hardware components directly. Unified Extensible Firmware Interface (UEFI) is a successor to the legacy PC BIOS, aiming to address its technical shortcomings. The BIOS of the original IBM PC and XT had no interactive user interface. Error codes or messages were displayed on the screen, or coded series of sounds were generated to signal errors when the power-on self-test (POST) had not proceeded to the point of successfully initializing a video display adapter. Options on the IBM PC and XT were set by switches and jumpers on the main board and on expansion cards. Starting around the mid-1990s, it became typical for the BIOS ROM to include a "BIOS configuration utility" (BCU) or "BIOS setup utility", accessed at system power-up by a particular key sequence. This program allowed the user to set system configuration options, of the type formerly set using DIP switches, through an interactive menu system controlled through the keyboard. In the interim period, IBM-compatible PCs‍—‌including the IBM AT‍—‌held configuration settings in battery-backed RAM and used a bootable configuration program on disk, not in the ROM, to set the configuration options contained in this memory. The disk was supplied with the computer, and if it was lost the system settings could not be changed. The same applied in general to computers with an EISA bus, for which the configuration program was called an EISA Configuration Utility (ECU). If the system has just been powered up or the reset button was pressed ("cold boot"), the full power-on self-test (POST) is run. If Ctrl+Alt+Delete was pressed ("warm boot"), a special flag value stored in nonvolatile BIOS memory ("CMOS") tested by the BIOS allows bypass of the lengthy POST and memory detection. The POST identifies, and initializes system devices such as the CPU, RAM, interrupt and DMA controllers and other parts of the chipset, video display card, keyboard, hard disk drive, optical disc drive and other basic hardware. Early IBM PCs had a routine in the POST that would download a program into RAM through the keyboard port and run it. This feature was intended for factory test or diagnostic purposes. When INT 19h is called, the BIOS attempts to locate boot loader software on a "boot device", such as a hard disk, a floppy disk, CD, or DVD. It loads and executes the first boot software it finds, giving it control of the PC. When a bootable device is found, the BIOS transfers control to the loaded sector. The BIOS does not interpret the contents of the boot sector other than to possibly check for the boot sector signature in the last two bytes. Interpretation of data structures like partition tables and BIOS Parameter Blocks is done by the boot program in the boot sector itself or by other programs loaded through the boot process. The user can select the boot priority implemented by the BIOS. For example, most computers have a hard disk that is bootable, but usually there is a removable-media drive that has higher boot priority, so the user can cause a removable disk to be booted. In most modern BIOSes, the boot priority order can be configured by the user. In older BIOSes, limited boot priority options are selectable; in the earliest BIOSes, a fixed priority scheme was implemented, with floppy disk drives first, fixed disks (i.e. hard disks) second, and typically no other boot devices supported, subject to modification of these rules by installed option ROMs. The BIOS in an early PC also usually would only boot from the first floppy disk drive or the first hard disk drive, even if there were two drives installed. With the El Torito optical media boot standard, the optical drive actually emulates a 3.5" high-density floppy disk to the BIOS for boot purposes. Reading the "first sector" of a CD-ROM or DVD-ROM is not a simply defined operation like it is on a floppy disk or a hard disk. Furthermore, the complexity of the medium makes it difficult to write a useful boot program in one sector. The bootable virtual floppy disk can contain software that provides access to the optical medium in its native format. On the original IBM PC and XT, if no bootable disk was found, ROM BASIC was started by calling INT 18h. Since few programs used BASIC in ROM, clone PC makers left it out; then a computer that failed to boot from a disk would display "No ROM BASIC" and halt (in response to INT 18h). Later computers would display a message like "No bootable disk found"; some would prompt for a disk to be inserted and a key to be pressed to retry the boot process. A modern BIOS may display nothing or may automatically enter the BIOS configuration utility when the boot process fails. The environment for the boot program is very simple: the CPU is in real mode and the general-purpose and segment registers are undefined, except CS, SS, SP, and DL. CS is always zero and IP is initially 0x7C00. Because boot programs are always loaded at this fixed address, there is no need for a boot program to be relocatable. DL may contain the drive number, as used with INT 13h, of the boot device. SS:SP points to a valid stack that is presumably large enough to support hardware interrupts, but otherwise SS and SP are undefined. (A stack must be already set up in order for interrupts to be serviced, and interrupts must be enabled in order for the system timer-tick interrupt, which BIOS always uses at least to maintain the time-of-day count and which it initializes during POST, to be active and for the keyboard to work. The keyboard works even if the BIOS keyboard service is not called; keystrokes are received and placed in the 15-character type-ahead buffer maintained by BIOS.) The boot program must set up its own stack, because the size of the stack set up by BIOS is unknown and its location is likewise variable; although the boot program can investigate the default stack by examining SS:SP, it is easier and shorter to just unconditionally set up a new stack. At boot time, all BIOS services are available, and the memory below address 0x00400 contains the interrupt vector table. BIOS POST has initialized the system timers, interrupt controller(s), DMA controller(s), and other motherboard/chipset hardware as necessary to bring all BIOS services to ready status. DRAM refresh for all system DRAM in conventional memory and extended memory, but not necessarily expanded memory, has been set up and is running. The interrupt vectors corresponding to the BIOS interrupts have been set to point at the appropriate entry points in the BIOS, hardware interrupt vectors for devices initialized by the BIOS have been set to point to the BIOS-provided ISRs, and some other interrupts, including ones that BIOS generates for programs to hook, have been set to a default dummy ISR that immediately returns. The BIOS maintains a reserved block of system RAM at addresses 0x00400–0x004FF with various parameters initialized during the POST. All memory at and above address 0x00500 can be used by the boot program; it may even overwrite itself. At this point, the extension ROM code takes over, typically testing and initializing the hardware it controls and registering interrupt vectors for use by post-boot applications. It may use BIOS services (including those provided by previously initialized option ROMs) to provide a user configuration interface, to display diagnostic information, or to do anything else that it requires. It is possible that an option ROM will not return to BIOS, pre-empting the BIOS's boot sequence altogether. A modern BIOS setup screen often features a PC Health Status or a Hardware Monitoring tab, which directly interfaces with a Hardware Monitor chip of the mainboard. This makes it possible to monitor CPU and chassis temperature, the voltage provided by the power supply unit, as well as monitor and control the speed of the fans connected to the motherboard. Once the system is booted, hardware monitoring and computer fan control is normally done directly by the Hardware Monitor chip itself, which can be a separate chip, interfaced through I²C or SMBus, or come as a part of a Super I/O solution, interfaced through Low Pin Count (LPC). Some operating systems, like NetBSD with envsys and OpenBSD with sysctl hw.sensors, feature integrated interfacing with hardware monitors, which is normally done without any interaction with the BIOS. However, in certain circumstances, the BIOS vendor also provides the underlying information about hardware monitoring through ACPI, in which case, the operating system may be using ACPI to perform hardware monitoring; this is done, for example, on some ASUSTeK motherboards with the AI Booster feature. BIOS replacement kit for a Dell 310 from the late 1980s. Included are two chips, a plastic holder for the chips, and a chip puller. American Megatrends BIOS 686. 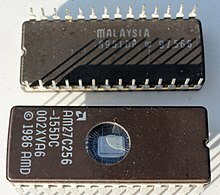 This BIOS chip is housed in a PLCC package in a socket. The second BIOS virus was a technique presented by John Heasman, principal security consultant for UK-based Next-Generation Security Software. In 2006, at the Black Hat Security Conference, he showed how to elevate privileges and read physical memory, using malicious procedures that replaced normal ACPI functions stored in flash memory. . In a December 2013 interview with 60 Minutes, Deborah Plunkett, Information Assurance Director for the US National Security Agency claimed the NSA had uncovered and thwarted a possible BIOS attack by a foreign nation state, targeting the US financial system. The program cited anonymous sources alleging it was a Chinese plot. However follow-up articles in The Guardian, The Atlantic, Wired and The Register refuted the NSA's claims. As of 2011[update], the BIOS is being replaced by the more complex Extensible Firmware Interface (EFI) in many new machines. EFI is a specification which replaces the runtime interface of the legacy BIOS. Initially written for the Intel Itanium architecture, EFI is now available for x86 and x86-64 platforms; the specification development is driven by The Unified EFI Forum, an industry Special Interest Group. EFI booting has been supported in only Microsoft Windows versions supporting GPT, the Linux kernel 2.6.1 and later, and macOS on Intel-based Macs. As of 2014[update], new PC hardware predominantly ships with UEFI firmware. The architecture of the rootkit safeguard can also prevent the system from running the user's own software changes, which makes UEFI controversial as a BIOS replacement in the open hardware community. ^ The signature at offset +0x1FE in boot sectors is 0x55 0xAA, that is 0x55 at offset +0x1FE and 0xAA at offset +0x1FF. Since little-endian representation must be assumed in the context of IBM PC compatible machines, this can be written as 16-bit word 0xAA55 in programs for x86 processors (note the swapped order), whereas it would have to be written as 0x55AA in programs for other CPU architectures using a big-endian representation. Since this has been mixed up numerous times in books and even in original Microsoft reference documents, this article uses the offset-based byte-wise on-disk representation to avoid any possible misinterpretation. ^ "Ref — System BIOS". PCGuide. Archived from the original on 21 December 2014. Retrieved 6 December 2014. ^ a b c d Kildall, Gary Arlen (January 1980). "The History of CP/M, THE EVOLUTION OF AN INDUSTRY: ONE PERSON'S VIEWPOINT" (Vol. 5, No. 1, Number 41 ed.). Dr. Dobb's Journal of Computer Calisthenics & Orthodontia. pp. 6–7. Archived from the original on 2016-11-24. Retrieved 2013-06-03. ^ a b Bradley, Tony. "R.I.P. BIOS: A UEFI Primer". PCWorld. Archived from the original on 2014-01-27. Retrieved 2014-01-27. ^ a b "IEEE Milestone in Electrical Engineering and Computing - CP/M - Microcomputer Operating System, 1974" (PDF). Computer History Museum. 2014-04-25. Archived (PDF) from the original on 2019-04-03. Retrieved 2019-04-03. ^ Shustek, Len (2016-08-02). "In His Own Words: Gary Kildall". Remarkable People. Computer History Museum. Archived from the original on 2016-12-17. ^ a b Killian, A. Joseph "Joe" (2001). "Gary Kildall's CP/M: Some early CP/M history - 1976-1977". Thomas "Todd" Fischer, IMSAI. Archived from the original on 2012-12-29. Retrieved 2013-06-03. ^ a b Fraley, Bob; Spicer, Dag (2007-01-26). "Oral History of Joseph Killian, Interviewed by: Bob Fraley, Edited by: Dag Spicer, Recorded: January 26, 2007, Mountain View, California, CHM Reference number: X3879.2007," (PDF). Computer History Museum. Archived (PDF) from the original on July 14, 2014. Retrieved 2013-06-03. ^ "HP BIOS Configuration Utility". Hewlett-Packard. 2013. Archived from the original on 2015-01-12. Retrieved 2015-01-12. ^ "IBM 5162 PC XT286 TechRef 68X2537 Technical Reference manual" (PDF). August 1986. p. 35 (System BIOS A-5). Archived (PDF) from the original on 2014-12-11. Retrieved 2014-12-11. ^ How StuffWorks: What BIOS Does Archived 2008-02-07 at the Wayback Machine. ^ Mueller, Scott (2001-06-08). "Processor Update Feature | Microprocessor Types and Specifications". InformIT. Archived from the original on 2014-04-16. Retrieved 2014-04-15. ^ "Linux* Processor Microcode Data File". Download Center. Downloadcenter.intel.com. 2009-09-23. Archived from the original on 2014-04-16. Retrieved 2014-04-15. ^ a b "How SLP and SLIC Works". guytechie.com. 2010-02-25. Archived from the original on 2015-02-03. Retrieved 2015-02-03. ^ "Create and add an OEM ACPI SLIC table module to a congatec BIOS" (PDF). congatec.com. 2011-06-16. Archived (PDF) from the original on 2014-08-02. Retrieved 2015-02-03. ^ Whitson Gordon. "A Beginner's Introduction to Overclocking Your Intel Processor". Lifehacker. Gawker Media. Archived from the original on 7 December 2014. Retrieved 6 December 2014. ^ Torres, Gabriel (24 November 2004). "Introduction and Lithium Battery". Replacing the Motherboard Battery. hardwaresecrets.com. Archived from the original on 24 December 2013. Retrieved June 20, 2013. ^ Constantine A. Murenin (2010-05-21). "11.1. Interfacing from the BIOS". OpenBSD Hardware Sensors — Environmental Monitoring and Fan Control (MMath thesis). University of Waterloo: UWSpace. hdl:10012/5234. Document ID: ab71498b6b1a60ﬀ817b29d56997a418. ^ Constantine A. Murenin (2007-04-17). "2. Hardware review". Generalised Interfacing with Microprocessor System Hardware Monitors. Proceedings of 2007 IEEE International Conference on Networking, Sensing and Control, 15–17 April 2007. London, United Kingdom: IEEE. pp. 901–906. doi:10.1109/ICNSC.2007.372901. ISBN 1-4244-1076-2. IEEE ICNSC 2007, pp. 901—906. ^ "aibs — ASUSTeK AI Booster ACPI ATK0110 voltage, temperature and fan sensor". OpenBSD, DragonFly BSD, NetBSD and FreeBSD. 2010. ^ "Decoding RAM & ROM Archived 2012-04-06 at the Wayback Machine." Smart Computing. June 1997. Volume 8, Issue 6. ^ "Upgrading Your Flash BIOS For Plug And Play Archived 2012-04-06 at the Wayback Machine." Smart Computing. March 1996. Volume 7, Issue 3. ^ "Time To Check BIOS Archived 2011-07-16 at the Wayback Machine." Smart Computing. April 1999. Volume 7, Issue 4. ^ Posted by Alex Watson, possibly repost from original content on custompc.com [unclear]. "The life and times of the modern motherboard". 2007-11-27. Archived from the original on 24 July 2012. Retrieved 2 February 2013. ^ David Hilber, Jr. (August 2009). "Considerations for Designing an Embedded Intel Architecture System with System Memory Down ®" (PDF). Intel. Archived (PDF) from the original on 18 October 2012. Retrieved 2 February 2013. ^ Stiller, Andreas (2001). "Prozessor-Patches". c't (in German). Heise (5): 240. Archived from the original on 2015-11-22. Retrieved 2015-11-21. ^ "Award BIOS logo". 2015-06-15. Archived from the original on 2015-12-21. Retrieved 2015-12-06. ^ "Black Hat 2006 Multimedia - Presentation, Audio and Video Archives". www.blackhat.com. Retrieved 2019-04-21. ^ Sacco, Anibal; Alfredo Ortéga. "Persistent BIOS Infection". Exploiting Stuff. Archived from the original on 2009-08-04. Retrieved 2010-02-06. ^ Fisher, Dennis. "Researchers unveil persistent BIOS attack methods". Threat Post. Archived from the original on 30 January 2010. Retrieved 2010-02-06. ^ Giuliani, Marco. "Mebromi: the first BIOS rootkit in the wild". blog. Archived from the original on 2011-09-23. Retrieved 2011-09-19. ^ "360发布"BMW病毒"技术分析报告". blog. Archived from the original on 2011-09-25. Retrieved 2011-09-19. ^ Yuan, Liang. "Trojan.Mebromi". Threat Response. Archived from the original on 2011-09-23. Retrieved 2011-09-19. ^ a b "How did 60 Minutes get cameras into a spy agency?". CBS News. Archived from the original on 2014-04-22. Retrieved 2014-04-15. ^ Spencer Ackerman in Washington (2013-12-16). "NSA goes on 60 Minutes: the definitive facts behind CBS's flawed report | World news". theguardian.com. Archived from the original on 2014-01-25. Retrieved 2014-01-27. ^ Friedersdorf, Conor (16 December 2013). "A Question for 60 Minutes: Why Would China Want to Destroy the Global Economy?". The Atlantic. Retrieved 2019-03-26. ^ Poulsen, Kevin (16 December 2013). "60 Minutes Puff Piece Claims NSA Saved U.S. From Cyberterrorism". Wired. ISSN 1059-1028. Retrieved 2019-03-26 – via www.wired.com. ^ tweet_btn(), Simon Sharwood 16 Dec 2013 at 03:13. "NSA alleges 'BIOS plot to destroy PCs'". www.theregister.co.uk. Retrieved 2019-03-26. ^ "Windows and GPT FAQ". microsoft.com. Microsoft. Archived from the original on 19 February 2011. Retrieved 6 December 2014. ^ "Extensible Firmware Interface (EFI) and Unified EFI (UEFI)". Intel. Archived from the original on 5 January 2010. Retrieved 6 December 2014. "BIOS Boot Specification 1.01" (PDF). Phoenix.com. January 11, 1996. "How BIOS Works". How Stuff Works. "Implementing a Plug and Play BIOS Using Intel's Boot Block Flash Memory" (PDF). Intel. February 1995. Retrieved November 28, 2007. "List of BIOS options". techarp.com. "Persistent BIOS Infection". Phrack (66). June 1, 2009. Retrieved April 30, 2011. "Preventing BIOS Failures Using Intel Boot Block Flash Memory" (PDF). Intel. December 1998. Retrieved March 29, 2007.